As I am flying to Poland again this weekend, I’ve had to cook a few Asian inspired dishes so that I can handle eating pierogi on repeat for a week 🙂 . Just kidding! There is plenty of fabulous vegan food in Krakow, so I am sure I won’t get bored! 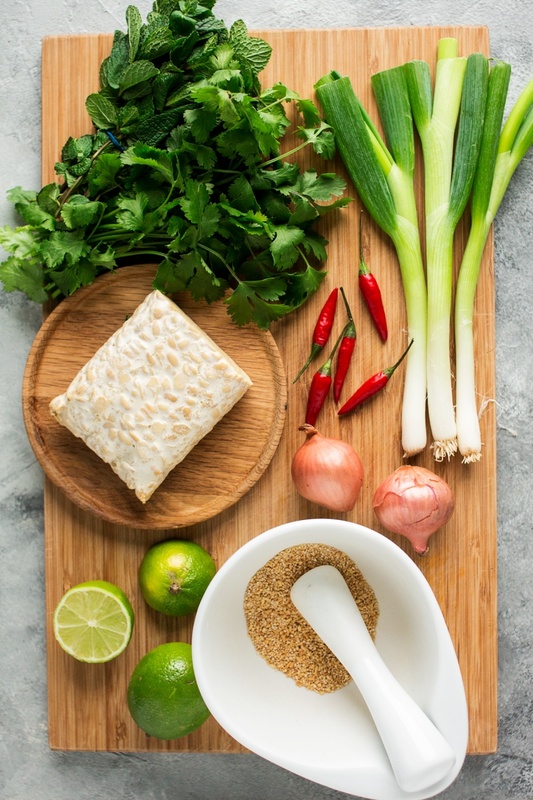 Today’s recipe is my attempt at veganising the national dish of Laos – larb. 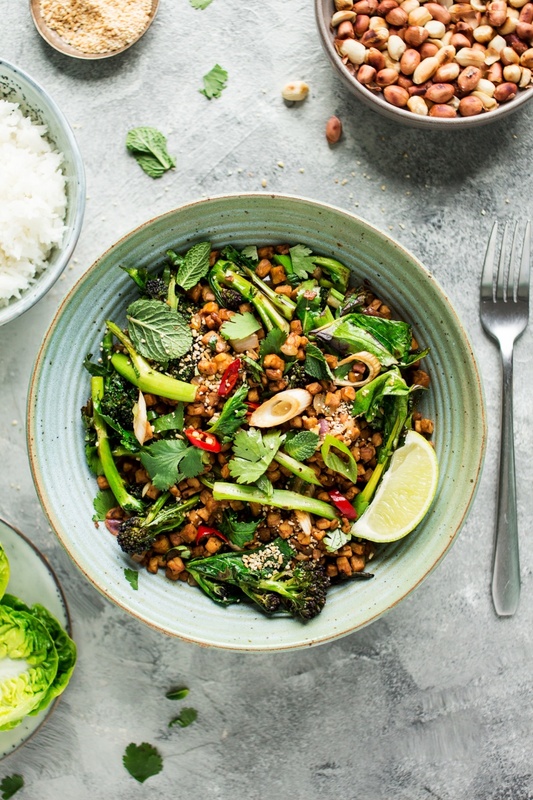 It features stir-fried mince, typically pork, that is seasoned with a liberal amount of lime juice and taken up to the next level with plenty of chopped up fresh herbs, like mint and coriander. It is a salad of sorts, so you can simply have it inside fresh lettuce leaves or mixed into rice, which I personally prefer. It’s delicious, aromatic, herbaceous and rather filling, so I figured it will make a perfect January meal, healthy yet satiating. I would not be myself if I hadn’t added some steamed broccoli to the mix, but you don’t have to! PS: If you make my vegan larb, don’t forget to tag me on Instagram as @lazycatkitchen and use the #lazycatkitchen hashtag. I love seeing your takes on my recipes! Heat up a wok and once hot, add raw rice to it. Gently toast the rice, stirring very frequently, until fragrant and golden (about 10 minutes). Pound cooled-off rice in a pestle and mortar until all the grains are broken up and set aside for later. Combine soy sauce / tamari (or vegan fish sauce), lime juice, ginger and sugar in a small bowl. Chop tempeh into a really fine dice or chop it up roughly and grind it up in a food processor, taking care not to overprocess it. Heat up 2 tbsp of oil in the same wok you used to toast the rice. Once hot, add cubed / ground tempeh to it. Stir-fry for a few minutes until browned in places. Add in shallots, spring onions (white part only) and chilli and stir-fry for another minute or so. Season with a good pinch of salt and pepper and mix in the marinade you prepared earlier. Toss the tempeh in the marinade. 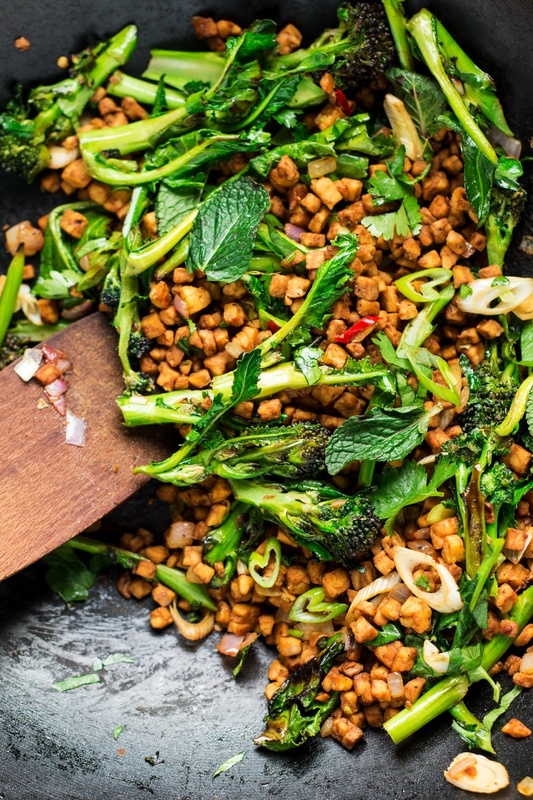 Once off the heat, incorporate 1-2 tbsp of toasted ground-up rice and 2/3 of the chopped herbs into the tempeh. Serve with cooked rice or inside lettuce leaves with extra herbs, the green part of the sliced onions and some more lime juice squeezed on top. 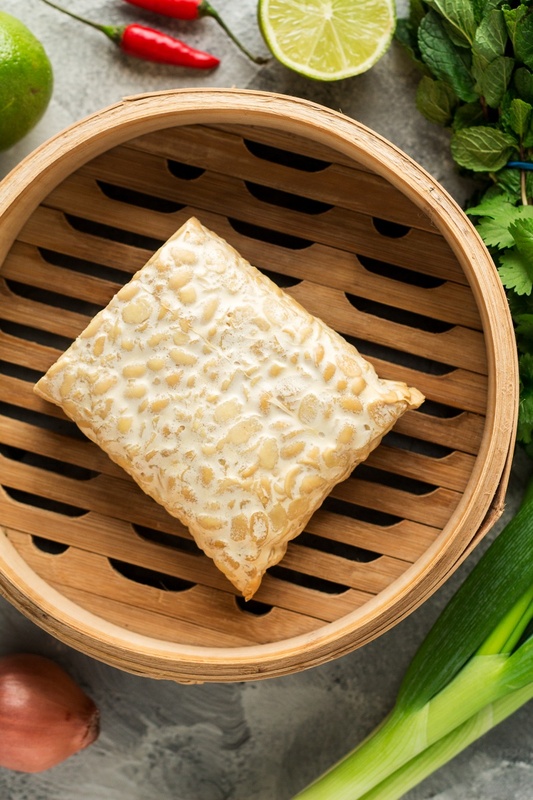 *This is an optional step, but you may want to steam or boil your tempeh first to remove the slightly bitter aftertaste. I steam the entire block (cut in half so that it fits) for 20 minutes in a bamboo steamer and then cool it down completely before stir-frying.